While fishing the edge of the reef with friends and family I had quite an interesting situation occur. We were easing along in about 120 feet of water looking to do some fishing. It was a perfect morning. The winds were light, there wasn’t a cloud in the sky and the water was a perfect aqua blue color. There was a steady current and it was obvious from the conditions that the Gulf Stream was in close to the edge. I was looking at the depth finder trying to find some holding mutton snapper to drop some deep jigs (heavy lead feathers) with fresh ballyhoo plugs down to. Spring is a good time to target mutton snapper. I love fishing for them because they pull hard, they are gorgeous fish to boat and photograph, and they make for some tasty dinner. Suddenly my Garmin depth finder showed that we were in 2 feet of water. It wasn’t just a momentarily blip, but it actually showed hard, steady bottom two feet underneath us. I get as frustrated as anyone when my electronics (especially new and well-maintained equipment) act up. I gave it the old fix-all side slap. Nothing changed. I turned it off and then on again. The screen came up and I waited for it to begin scrolling. There it was holding steady at two feet again. Now I was simply frustrated. I knew for a fact that we were in over a hundred feet of water! I exhaled loudly, stepped away from the screen and gazed overboard. Suddenly I saw that we were about to run aground! “What the hell is going on?” I exclaimed. “How can we be so shallow?” I asked to no one in particular. Everyone onboard peered down to see what on earth I could possibly be talking about. Suddenly the “ground” started easing out from under us and it was covered in spots! 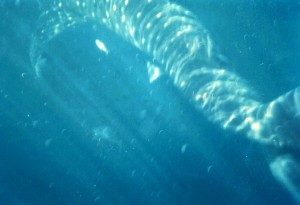 It was a thirty-foot whale shark! It was an amazing sight to behold. It was longer and wider than the boat, and breathtakingly beautiful. It came up next to us, stuck its face up out the water and just hovered there. My sister grabbed my camera and started snapping pictures while we watched this amazing creature to see what it was going to do next. She asked, “Are those sharks down there under it?” My friend Gainey, who is an experienced angler, grabbed a mask and stuck his head over the side into the water to take a closer look at what my sister had seen. “Those are cobia!”, he exclaimed. Cobia are a highly sought after sport fish. They do indeed look like sharks. “There are two of them. They must go sixty or seventy pounds!” he exclaimed as he shook the water out of his ears and threw down the mask. He began busying himself with rigging a rod that could handle those massive fish. 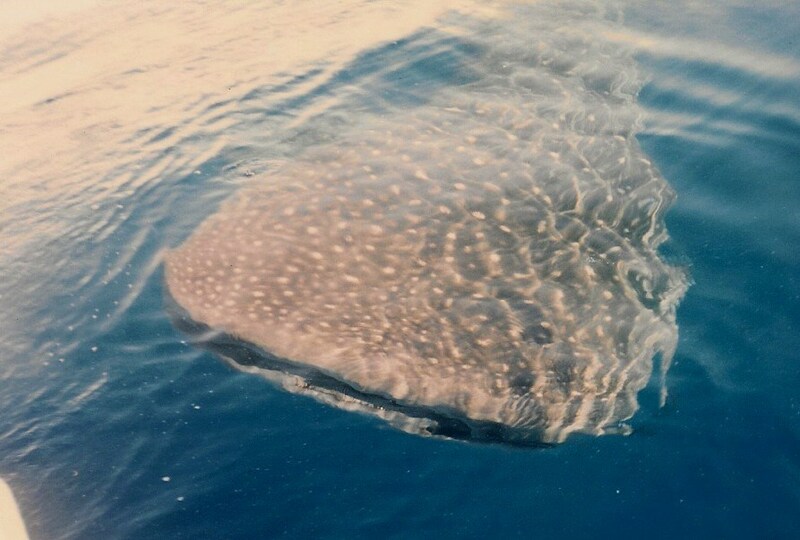 Meanwhile the whale shark had come behind my boat and began to scratch its head and back on the skeg and propeller of my outboard engine (I had taken the boat out of gear). It was rubbing itself so thoroughly that my vessel was lifting up in the water and side-to-side a bit. At this point I was totally enamored by this amazing creature and flabbergasted by it’s behavior. I was in the back of the boat as close to the whale shark as I could get. I reached down and began to pet and scratch the big fish on its head. It seemed to be as intrigued by me as I was by it. It abandoned my engine and popped its head up behind the boat like a pet dog seeking its master’s affection. It stared right into my eyes as I pet and scratched its head. My sister took my camera, which was waterproof, stuck it in the water and began trying to take underwater shots of our new friend. Gainey began pitching a deep jig with a whole fresh ballyhoo attached to the swimming cobia. I love cobia. They are another one of my favorite fish to catch. 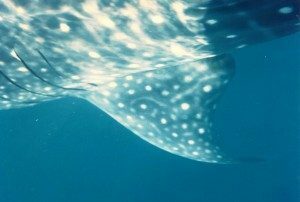 I have to admit that I was much more interested in the whale shark and enjoying our ‘moment’ with it than in fishing in that instance. The cobia pursued the jig halfheartedly and one even nipped the back of the ballyhoo, but it was pretty clear that they were more concerned with following their host whale shark than eating our lure and bait. Finally the whale shark began flicking its tail and started easing away from us. We followed for a bit while Gainey took a few more casts at the cobia. The beautiful creature began lazily swimming down into the depths. Deeper and deeper it dropped. It showed clearly on my ‘functioning’ depth finder (We were in 130 feet of water) for a while until finally it swam out of range. It was an amazing experience that none of us are ever going to forget. We lamented not hooking the cobia of course, but we were far from disappointed. It was another great day of many. Another “fix” for our mutual addictions to the ocean, fishing and getting out on the water. If you look closely under the whale shark you can see the cobia swimming along with it.